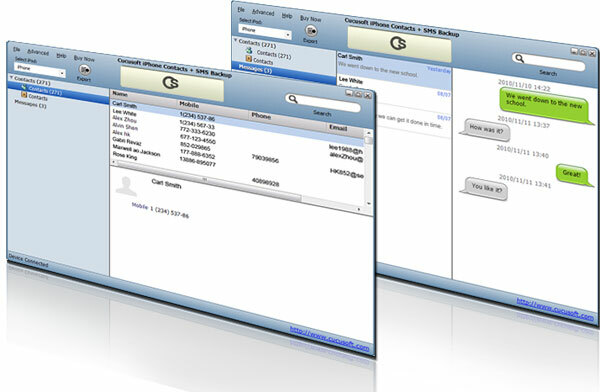 Cucusoft iPhone Contacts + SMS Backup is a software tool that can assist you in organizing and transferring your contacts and SMS from your iPhone to your computer. With the help of this program, you can be assured that your contacts and SMS are safe and secured. 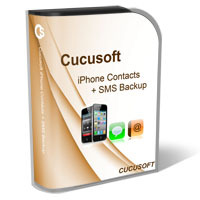 "iPhone Contacts + SMS Backup" is a component of Cucusoft iPhone Tool Kits. If you require more functionalities, please check Cucusoft iPhone Tool Kits software. Keep your Contacts and SMS protected! In reality, the contacts and SMS stored on your iPhone is more valuable that the worth of your actual phone. If you lost your phone, you can always replace it with the latest and newer model but the contacts and SMS you have in it is priceless. Therefore, we highly recommend that you back up your contacts and SMS on a regular basis. Cucusoft iPhone Contacts + SMS Backup can precisely facilitate you in this task as it can take a snapshot of your contacts and SMS so your personal information will never be lost. Can export contacts from iPhone to PC. Can back up contacts and edit copied contacts. Can export SMS from iPhone to PC. Allows multiple export file formats, including .txt, .mht and more. Can back up SMS and edit copied SMS. Supports multiple languages, such as English, Chinese and more.